Larger than the planets Mercury and Pluto and the second largest moon in the solar system (after Jupiter’s Ganymede), Titan is the only known moon in the solar system with a substantial atmosphere. Its atmosphere is largely nitrogen with a small amount of methane and a variety of other hydrocarbons—organic compounds that give it an orange color. 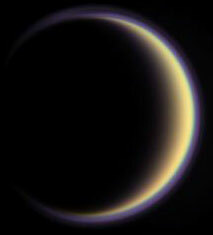 The smoggy atmosphere obscures the moon’s surface when viewed at visible light wavelengths, making Titan one of the most mysterious objects in the solar system. 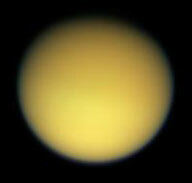 Exploring Titan is a primary objective of the mission because scientists think that it may resemble the early Earth. 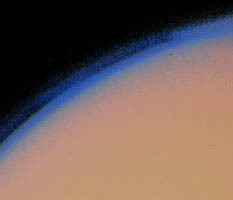 If so, Titan and its hydrocarbon-laced atmosphere may provide chemical clues to life’s inception here.